assistant Carla left in her place is driving me crazy. even my system for running my business. I don’t care what she heard, I am not a problem child. I just know what’s tried and true. of her as something I haven’t cultivated in a long time. A friend. skills border on diabolical. Also, two cats named Ramen and Sushi. 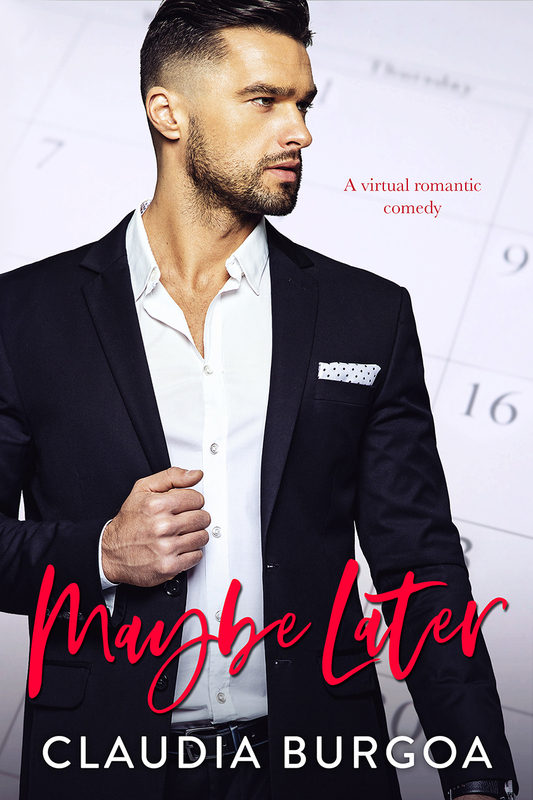 Maybe Later is a fun new take on romance. I love how Amy and Jackson meet initially. Amy is a pretty cool chick dealing with some past hurts. Jackson is a closed off guy dealing with some past hurts. These two open each other up and truly connect with each other. I’m trying to keep this review vague as I can just because I loved the whole set up of the book. Claudia Burgoa gives us an amazing story with some amazingly flawed characters. Claudia Borgua is a new to me author and I’m seriously considering stalking her whole backlist of books now! Maybe Later was such a yummy read and I’m having a major author-crush moment here. I’m going to keep this super vague because this is spoiler free zone, but this story was so so good. The MCs had everything I love in a story, fantastic banter, electric chemistry, and a delicious slow burn that I didn’t know I needed. But it wasn’t all heat and steam, there was good ol’ romance too. At the heart of it is two good people who have a hard time letting other people in. It’s also a boss/employee romance which this booknerd can’t get enough of! And let me just tell you this wasn’t a cookie cutter version of all the others, it completely stood out to me. I definitely enjoyed Maybe Later and will be adding Claudia Borgua’s other books to my TBR, ASAP! I also think that this is a definite must read for lovers of boss/employee romances or just lovers of romance in general. Get it. It’s awesome. 4 Stars. aggressive, micromanaging, and somehow a social piranha. quantities of chocolate to keep the last threads of sanity intact.